Thank you sir. You know you are welcome to shoot it any time you come for a visit. You can even carry it while here. I will have to have it back before you leave. Thank you for these sights. I am going there now. Do you know how the belt loop is designed??? Not at all interested in cross draw. In the picture, it is set up for cross draw. But if you ran the belt out that second belt loop, it would be set up for strong side draw. I like the setup. For the price right now I think I just may get one. Lobo seems to have established a pretty good reputation, although I don't have any personal experience. Boxerrider wrote: Lobo seems to have established a pretty good reputation, although I don't have any personal experience. Thank you sir. kinda like the looks of this guys Avenger. Lone Star Holsters in Early, Texas makes something similar to what you are asking about..
"It's not the wolves of the wild that I fear, but the sheep, the sheep cause me concern.."
Thank you TxLobo. I like several that I see there. Are you owner??? longtooth wrote: Probably what I will do. He sure make some good holsters. I own an HF2 because of you LT! 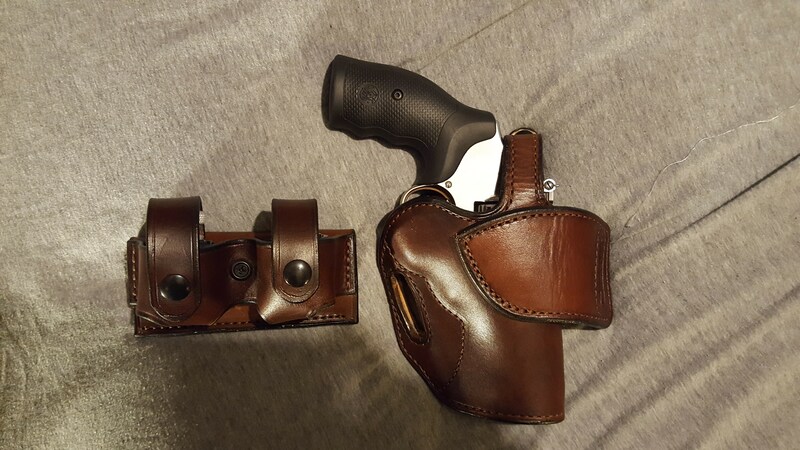 I always loved your holster and once I got to a point in my life where I could comfortably afford it, I got it. Now it's my BBQ rig holster for my 1911s. I did not even find the HF2 on the new web page. I am going back to look again. Checked again and since it is now Tucker and Bird it seems the HF2 has been dropped. The SST is the closest thing they have. It has no provision for a Thumb break. Thank you for your confidence in a man long deceased. Nooo.. I wished I had the talent to work with leather.. for now, I will continue to work on computers. Their Combat classic w/ Thumb Break. Thanks for all the help here. When I had a 3" 686+, I purchased a Tucker and Byrd SST holster and they added a thumb break for a nominal fee. That was a great holster. Abraham wrote: Side question: If a revolver is also referred to as a 'Wheel Gun', would it be fair to call a semi-auto a 'Rectangular Gun'?